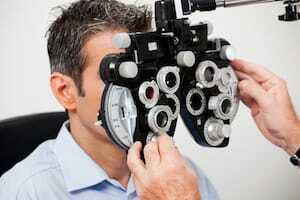 Get An Eye Exam During Men’s Health Month! While studies show that women are more likely to develop eye health issues than men, it’s still crucial for men to remember the importance of properly taking care of their eyes and getting a yearly eye exam—especially during National Men’s Health Month! Find out why eye exams are important. Even if it seems that your sight is 20/20, only an optometrist can confirm whether you need a prescription or not. Also, even if you already have prescription glasses or contact lenses, you still need to get your eyes checked. Your eyes change as you age so it is important to monitor any corrective needs through regular eye exams. Regular eye exams help prevent vision problems before they occur! Don’t assume that your eyes are great because they are not showing any symptoms of a health condition. Many common eye problems actually do not show any symptoms until well after they’re developed. Through an eye exam, your optometrist can detect disorders such as glaucoma and cataracts at an early stage, which can increase the chance of a successful treatment. Did you know that eye health is connected to overall health and well-being? Through eye exams, an optometrist can detect more than eye problems; they can also uncover signs of health conditions such as diabetes, high cholesterol and high blood pressure—making eye exams arguably as important as annual physicals. Our eyes are one of the most important parts of our bodies—especially when it comes to living our day-to-day lives. Unfortunately, they are very fragile and can easily be damaged. Take advantage of National Men’s Health Month and schedule your eye exam with Valley Eyecare Center today! For more information or to schedule an appointment with one of our optometrists, visit our website.